Brick City Tours was developed within the Mobile Experiences for Tourism course in RIT’s master’s in human computer interaction program, created by Brian O’Keefe, a visiting assistant professor in RIT’s B. Thomas Golisano College of Computing and Information Sciences. The course brought together graduate students from across RIT to research and develop pervasive mobile technologies that create new visitor experiences before, during and after visits. The technology uses a location’s history, storytelling, culture and arts to create personalized tour experiences and educational opportunities. On some tours, history and culture is automatically delivered to the visitor in the form of a text, phone call or augmented reality, also known as Blended Interaction. The tour-related media is triggered when a visitor walks into a specific GPS hotspot, also called a geo-fence. 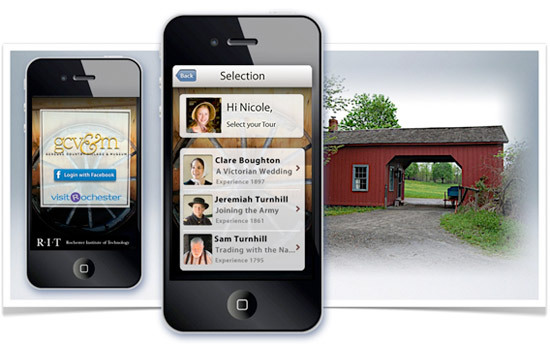 “Our research at the museum looks at how to leverage mobile technologies to supplement educational lessons in the classroom to on-site historical locations while on a field trip,” says O’Keefe. After the tour, the mobile technologies gather both visitor and professional content to create souvenirs based on the specific places each person visits. Personalized physical keepsakes, such as postcards, photo books and posters, or digital souvenirs, such as slide shows and social media services, can easily be provided for visitors after the tour. Through these mobile services the technologies learn about visitors and proactively suggest areas and artifacts of interest for future visits. “Proactive technologies can be used to attract new visitors to the Finger Lakes region, thereby increasing the economic impact of the sector while improving individual user’s tourism experiences,” says Greg Marshall, senior vice president of VisitRochester. O’Keefe is working with collaborators David Benyon and Oliver Mival, advisory board members from Edinburgh Napier University, Scotland, on the project. Following validation and testing, the RIT team of interactive designers, artists, videographers and developers expect to have a high-fidelity prototype in use at the Genesee Country Village and Museum in fall 2013. For more information about the project and course, go to wallacecenter.rit.edu/tls/students-creating-mobile-experiences.